Brain Injury: On March 7th, 2005 I was in a head on collision. I don’t remember 4 ½ months, and I have short term memory loss. I broke every bone above my lower jaw. I really struggled with anger! 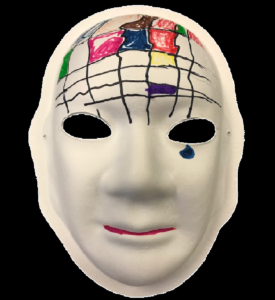 Explanation of Mask: The maze represents the struggle to re-learn to walk, talk, and swallow, it also represents my new “normal”. The contrasting red + blue represent my old and new “normal”. The “black” eye represents losing my left eye. Brain Injury: Feb. 5th, 2001 collecting mail from my apt mailbox on foot, I was hit by a 69 yr old gentleman w/ emphazema & diabetes so hard I was in a coma for one month. Dr. Mark Stevens, neurosurgeron @ Mayo Clinic Health System, gave me a shunt to relieve the increasing pressure of my brain & prayed for me as he worked. I thank God for him every day. He inspired me to volunteer @ Mayo since October 2001, to present, to help others as Dr. Stevens & the Good lord, helped me. Explanation of Mask: Red is for where my stroke was. Black is for all I can’t do now – challenged, overwhelmed and frustrated at times. For pain – headaches. Green represents being resilient and strong and to keep trying. Orange is for humorous, funny and playful. I’m big tease. White is what I can still do today. For my wife, children, Grand and Great Grandchildren! Our friends too and my pet cat Squirt. Brain Injury: Stroke and discovery of two brain aneurysms. I have them checked yearly. People tell me “You’re a walking time bomb” and “You don’t look like you had a stroke.” What am I supposed to look like? Tear drop – represents all negative feelings I have. Fearful, irritated, frustration, anger, forgetful, depression, misunderstood. I try to be positive in my daily life. I want others to know that things could be worse, be thankful! 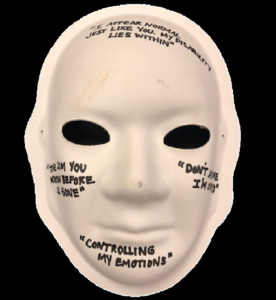 Explanation of Mask: My mask is self-explanatory. Brain Injury: Four years ago, I suffered a stroke which did not affect my physical abilities but affected my speech, memory and general confusion at times. I know I am not the person I once was. 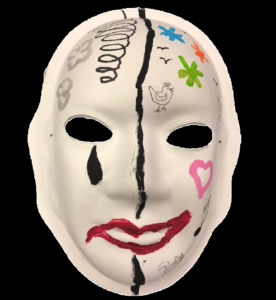 Explanation of Mask: The mask reveals my hopes for a complete recovery. While I know I may never have a complete recovery but I press on. 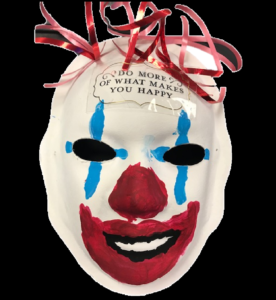 The mask says, “Do more of what makes you happy”. I cannot control what others think of me but I can control my own attitude towards others and daily activities. 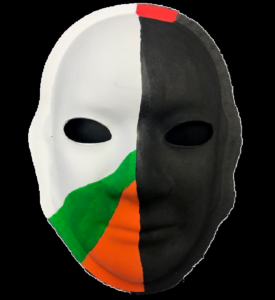 The mask is like an alter ego which hides the pain inside that I sometimes feel. The mask is what I hope to become. Brain Injury: Right side of brain was damaged due to a stroke. 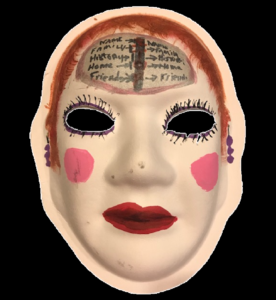 Explanation of Mask: I have been a stroke survivor for 9 years. I continue to enjoy life because of my supportive family, doing activities that I want to do. 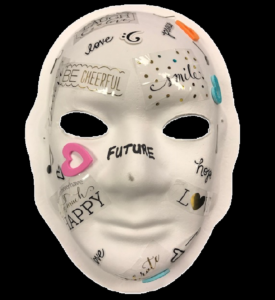 My mask is a symbol of how I feel about my life and what you make of it. I am happy. Brain Injury: In January 2011, I had a stroke that affected the left side of my body. 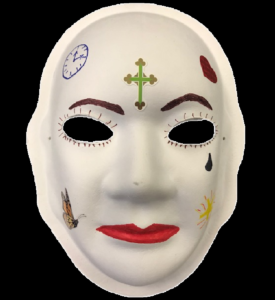 Explanation of Mask: The words and symbols represent my faith that Jesus will help me through this journey. The heart represents that I should still love myself. The blue flower represents my motivation to keep exercising. The pink flower represents frustration. The green flower represents being overwhelmed. The black represents my effected side. Brain Injury: Two separate singular ischemic strokes. Dot is a vanishing point, it defines both extrospection introspective. Coincidentally, it shows the relationship of the outer facial area, and relative intensity of new life changing point. 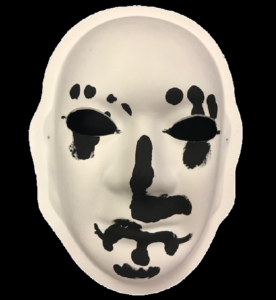 In some cultures, facial markings visually represent ones’ standing in society. The after effects of a stroke, sometimes resonate subtlety or overtly, confronted with the change one navigates in societal standings, because of diminishments of lost abilities. Explanation of Mask: My mask is my way of expressing my emotions and frustrations. Brain Injury: I had a stroke in 2004. It was on the left side of my brain. It affected my speech and my right arm. 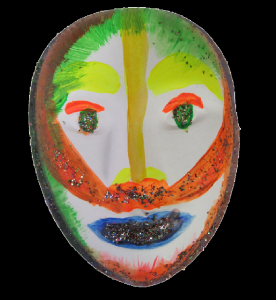 Explanation of Mask: Past – NO. Future! Future! Future! Brain Injury: Vertebral artery dissection affected the cerebellum and brain stem giving me two strokes in one weekend. 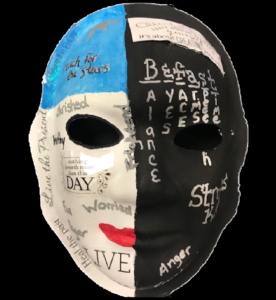 Explanation of Mask: Awareness is what it is all about: The black side represents the anger and frustration of having strokes, yet also teaches awareness of what to look for if you or a loved one, friend etc. might be having a stroke. Also, the sticker at the top I thought really described me because after stroke I never did get back totally to my old self but created a new me. With keeping some old traits too. 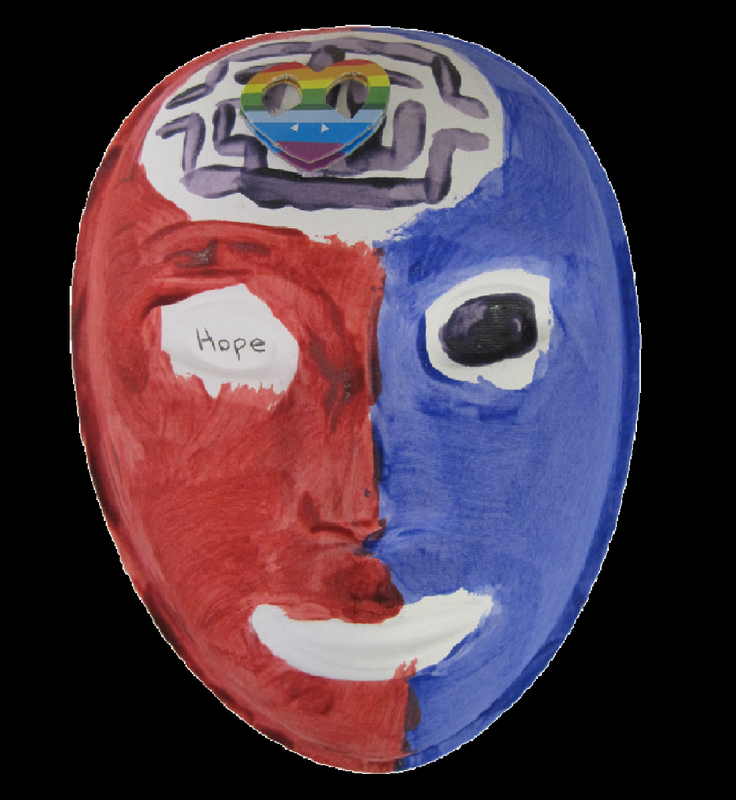 The white side represents life after stroke. More feelings I have after stroke. Usually these and somedays more added. Brain Injury: In July 2017 I had a gigantic brain aneurysm. During surgery to get the bleeding to stop I had a stroke. I cannot do many of the things that I used to do. I do not feel “complete” or “whole”. I know one day I will be back to doing everything that I used to do, but I am not a very patient person. I have faith that I will make a full recovery. 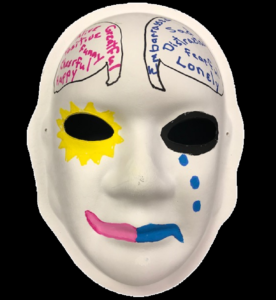 Explanation of Mask: Events that I missed are marked with certain colors: pink and blue are grandchildren’s birthdays that I missed. Orange and brown are for Halloween with the grandchildren. Red and green are Christmas. Red is Valentine’s Day and my wedding anniversary. 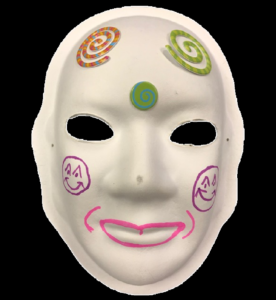 Explanation of Mask: The best thing to do is put on a smiling face. Brain Injury: From a stroke on Christmas Eve of 2014. 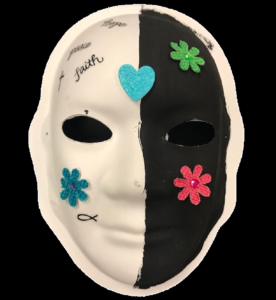 Explanation of Mask: Describing the positive and negative side of personality after my stroke. 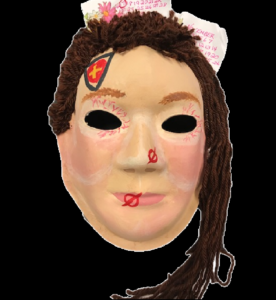 Explanation of Mask: Shortened, shaved hair on the right side and top of head represent the cerebral shunt needed due to increased intracranial pressure. Fractures around the eyes represent various orbital fractures causing binocular diplopia (double vision). Symbol on the nose represents loss of smell. Symbol over the mouth represents loss of taste. Red heart represents love, prayers and support of family. Yellow cross represents the many prayers for healing offered by family, friends and churches. Black triangle represents my three and a half weeks in a coma. October & November 2017 – My fall happened October 17, 2017. In November, once out of my coma and stable, I was flown to Shirley Ryan Ability Lab for rehab in Illinois. 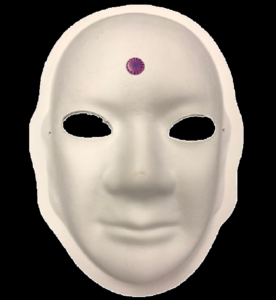 Explanation of Mask: My mask shows normal on the outside with a malfunction of my brain. It explains how all links to memory stop, name, my home, my family, where I went to school. There is no link to retrieve until it, on its own, returns. It is not like losing your keys, or forgetting an appointment. It is totally blank. It is frustrating when people tell me its normal. I feel like people question my reality.